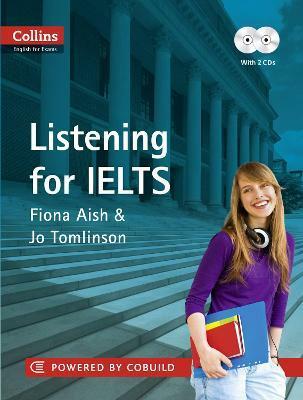 If your listening is preventing you from getting the score you need in IELTS, Collins Listening for IELTS can help. Don't let one skill hold you back. Collins Listening for IELTS has been specially created for learners of English who plan to take the IELTS exam to demonstrate that they have the required ability to communicate effectively in English, either at work or at university. It is ideal for learners with band score 5 - 5.5 who are aiming for band score 6 or higher on the IELTS test (CEF level B1 and above). The International English Language Testing System (IELTS) is sat by over 1.4 million candidates around the world every year. It is the most common test used by universities for foreign students to prove their language level. IELTS is also increasingly used for immigration purposes, with Australia, New Zealand and Canada all requiring visa applicants whose first language is not English to submit an IELTS grade. The system tests candidates' Reading, Writing, Listening and Speaking in four separate papers. Usually, students must gain a good mark in all four skills in order to gain entry to the course, job, or country of their choice. For this reason, candidates will often sit the exam numerous times to secure the score that they need. The 4-billion-word Collins corpus is the world's largest database of the English language. It is updated every month and has been at the heart of Collins COBUILD for over 20 years. This book will help you to recognize and understand differences in pronunciation and vocabulary. It includes a CD covering a number of business topics, spoken by both native and non-native speakers of English. Jo Tomlinson has a broad range of experience teaching academic English and IELTS in both private college and university settings, including online assessment. Fiona Aish has managed and taught on various exam and academic English programmes at private language schools and universities, and has been preparing students for IELTS for over 10 years. Jo and Fiona are co-owners of Target English, an English language training company that specialises in preparing and supporting university students in the UK.